This was a singing event featuring idol songs of the 1980's by minor idols and seiyuu. There were around 30 people in the crowd. I went to watch Nagai Noa, and this was her second singing event after coming back from a long gap. Noa was wearing a white one piece, with red cherries. 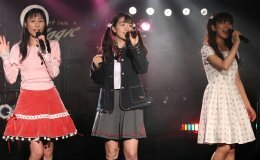 The four songs that Noa sang were: "Natsu Iro no Tenshi", "Naze", "Totemo Chiisana Monogatari", and "Kimi ha Dokoni Iruno". Noa said that she went to the ramen museum recently, and made her own ramen. She brought three of them, and gave them away as presents. I used my 20D, and took 844 photos, with ??? of them worth keeping. I only kept photos with Noa in them.